A Farm Tour and Plant Sale mixed with unseasonably cold spring rain? That spells a good time. We are so thankful for the folks – aged 3 to 94! – that joined us for our first Farm Tour and Plant Sale. It was cold and wet! But smiles were abundant. We’ve heard from so many people this week that either weren’t able to make it or found out about the tour too late. So we’ll have our next guided tour on Saturday, June 2nd, at 4:00. Please join us! Until then, we’re providing here the narrative of our self-guided tour to give readers an idea of what goes on here at Broadfork. We do hope you’ll be able to make it here to see it all in person and ask questions. This morning is the official opening day of spring markets. Though we’ve been harvesting bits of vegetables since the beginning of March, and plan to offer salad greens all winter for 2012-2013, this marks the start of our busiest season. 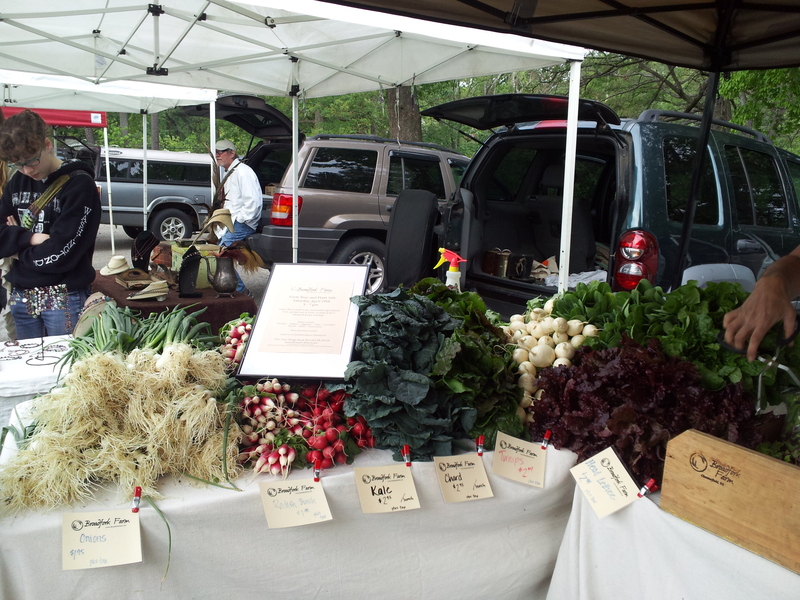 We hope to see you at market, with us peeking out from behind a bountiful mound of Certified Naturally Grown produce! We began our farm here by purchasing these 5 (wooded) acres in late 2008. We promptly had the trees cleared from half the acreage and planted cover crops in 2009 to break up the soil, add organic matter, add nutrients, and make minerals available in the soil. In 2010 we began a Compost Tea company by the name of LivingSoils. (Compost tea is an all-natural plant food that is full of microbes that healthy soil needs.) 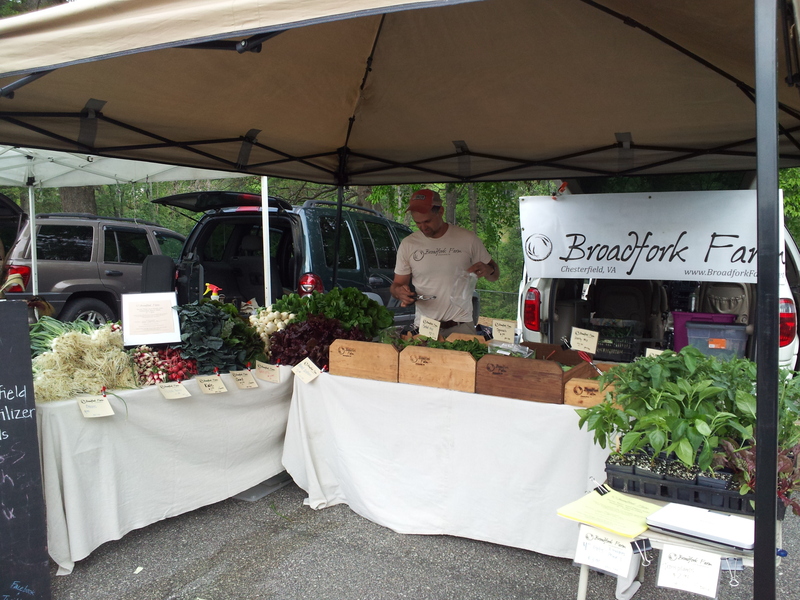 In 2011 we officially formed Broadfork and began marketing produce and flowers, in addition to compost tea, now sold under the Broadfork name. For 2012 we are growing three or four times as much as last year and utilizing some part-time help. We are soon clearing more land in order to 1) have more space on which to grow and 2) have enough space to let some fields “rest” each year, being planted with cover crops instead of crops for sale. Dan works on the farm full time and currently manages all of the growing operation. All of the farm’s income is currently being re-invested into the farm. Janet works an office job off the farm to provide income for the family (but works mostly from home in order to be around the kids.) She is responsible for the marketing and business management. We have three young children (ages 5, 3, and infant) and share child-care duties while balancing our work. Janet’s parents and sister’s family both live on adjoining properties. Janet grew up on this land, her grandmother living in the house in which we now live. We chose to move here in 2006 (after living in various parts of the country) in order to raise children in a multi-generational setting and farm in a temperate climate in a region in need of more small, biological farms. Our produce and flowers are Certified Naturally Grown, which is the peer-reviewed equivalent of Organic certification. Please pick up a map which has numbered stops that correspond to the descriptions below. Look for the numbered signs to orient you. 1. Curved, raised beds. We grow in permanent, raised beds in order to maximize space and water conservation and minimize soil compaction. We use plastic or straw mulch to minimize weeds and conserve water. The black tubes are part of our drip irrigation system which also allows us to minimize our water usage. Our biggest challenge currently (besides start-up capital!) is water: we have only a shallow-well and no running water on the property; we are drilling a deep well very soon! The curve in the beds is on contour with the land: this set-up helps prevent erosion, also helping to make the most of rainfall. You may notice various orange flags around our fields. They demark the blocks with which we organize our beds to aid in planning our crop rotation. Putting different plant families in each block each year is good for the soil due to the differing types of nutrients the crops use and the differing types of pests they each attract. 2. Upper Compost Pile. We purchase some compost from Watkins Nurseries – this is a vegetable-based compost made from Ukrops’ food waste. Literally tons of compost make these plants grow, free from any chemical inputs. We spread the compost on the beds prior to laying plastic, transplanting, or direct seeding. We are continually building the health of our soil, as it is the foundation of the entire farm. It has come so far in just the past three years!! 3. Deer Fence. Deer pressure is extremely intense around here. (The name of the road does give a good warning.) This 7 ft high fence, aided by an electric strand at the bottom, completely surrounds our current growing area in order to keep deer out. While deer can easily jump over a 7 foot barrier, this fence works by taking advantage of a deer’s poor eyesight: while standing at the fence and looking up, the top of the fence is not visible to the deer. With no way to gauge how high to jump, the deer don’t attempt. This requires constant attention and maintenance in order to be effective. We have had a couple trees fall on the fence just in its first year. 4. Walk in Cooler. The day before market day, all produce and flowers are stored in this building after being harvested and packed. It is kept cool through the use of a computer connected to an air conditioning unit. The computer over-rides the minimum low setting of the a/c, allowing us to set it for around 40 degrees. The structure is insulated with 4 inches of rigid foam insulation. The structure itself is framed using re-claimed steel containers that Janet’s father welded for his construction company 20-some years ago. One container is inverted over the other. Dan finished the framing to include the door, and the siding is made from lumber milled from the pine trees that used to occupy these fields. (See Wood Lot, below.) We have some home-improvement projects in the wings (the pile of insulation beside the cooler will be installed on the exterior bricks of our house to provide insulation to the house, which currently has none). The house, including a planned addition, will then be sided and roofed to match the cooler. We chose a light-colored metal roof in order to reflect the hot summer sunlight. 5. Seedling greenhouse. We start all of our plants from seed, with the exception of onions, potatoes, and garlic (for which we purchase sets and bulbs, certified organic when available). We use fertilizer and potting soil in accordance with Organic standards. We heat with least amount of electricity and propane that we can get by with. (We’re not trying to force tomatoes or summer squash in March – we just grow seedlings.) Everything is started in trays and transplanted out into our fields by hand. 6. Straw pile. This tarp is keeping our precious straw dry. We purchase this directly from the grower in Amelia, after checking to be sure he doesn’t spray his fields with chemicals that would kill our plants, and depend upon it heavily for mulching. 7. Wood Lot. We have had a man with a portable saw mill here on occasion to mill pine trees that we have taken down. We are using lumber for siding, and some timber for future construction projects. The challenge is in keeping the lumber sufficiently dry and free from mildew. 8. Mushrooms. We inoculated these logs in February of 2011. (See website for photos of the process.) They are inoculated with Shiitake and Oyster fungi. Small critters, as well as deer, seem to enjoy them just as much as we do, so we are likely moving these into a greenhouse. Future mushroom cultivation involves more varieties and growing them in sawdust. 9. Papa’s Garden. If you’d like to venture down the driveway, Janet’s father (affectionately known to all as “Papa”) has a garden that utilizes many of our growing techniques in a family-sized garden. Feel free to check it out, compliment him on his work, and inquire about how he intends to harvest tomatoes growing at the top of his ten-foot trellis (that part is not one of our techniques!) To get there, continue down the driveway, past the wood lot. When the driveway forks to the left, continue straight/right. The garden is on the left, surrounded by a deer fence, and has the tell-tale 10 foot trellis structures. It is about ¼ mile walk. 11. Orchard We planted 30 fruit trees two years ago. There is a mix of apple, pear, cherry, peach, apricot, paw-paw, persimmon, and jujube here. Also embedded in the midst is a small patch of strawberries – just enough for our family. 12. Compost tea brewer and organic fertilizer stash. We brew compost tea in a 55-gallon barrel over the course of 24-36 hours to extract beneficial microbes from solid compost and encourage them to reproduce many times over in the presence of air and food. The result is used on our fields and sold to our enthusiastic customers at market. Under the lean-to is our stack of chicken-manure based organic fertilizer. 13. Equipment. (Please do not climb on any tractors or other equipment you may see!) We use a tractor and implements specialized for our scale to prepare our beds for planting, including a reverse-tine tiller. On their way to our farm is a compost spreader and a bed shaper that lays drip tape and plastic mulch. There will surely be photos on the website soon of our excitement while using the new equipment. 14. Chickens. We have a flock of about 40 laying hens. Their coop and fence are portable and they rotate around to our different fields, including the orchard, to weed and fertilize the soil. The scratch and eat grass and bugs all day, in addition to vegetable scraps when in season, and sleep in their coop each night. We currently keep them throughout the winter, when their egg laying decreases, rather than get new chicks each year. 15. Wood-fired Oven. We use this wood-fired oven to bake bread and pizza. We started baking bread for market this season, using a naturally-leavened dough that is given a delicious crust due to the nature of baking on a wood-fired hearth. We held a Pizza Night in the fall of 2011, featuring our vegetables and the meat, cheese, and fruit of other local farms. Look for more Pizza Nights in the future, and bread too, as we seek to diversify our business and increase product availability in the winter. 16. Back field. Potatoes are planted in the tilled area here, and a small patch of asparagus (just enough for our family) eeks out an existence behind the clothesline. Please trod carefully. We planted the asparagus in 2008 and started harvesting it in 2011. 17. Greenhouse. This greenhouse, in which we plant directly into beds in the soil, allows us to harvest salad during the cooler months, as well as early tomatoes in the summer and ginger in the fall.